Ctrl+PgDn: Switch among worksheet tabs; it is used left-to-right. Ctrl+PgUp: Switch among worksheet tabs; it is used right-to-left. Ctrl+Shift+&: Apply outline border to selected cells in a worksheet. Ctrl+Shift_: Helps remove outline border from highlighted cells in a worksheet. Ctrl+Shift+~: Apply number format to a range of selected cells. 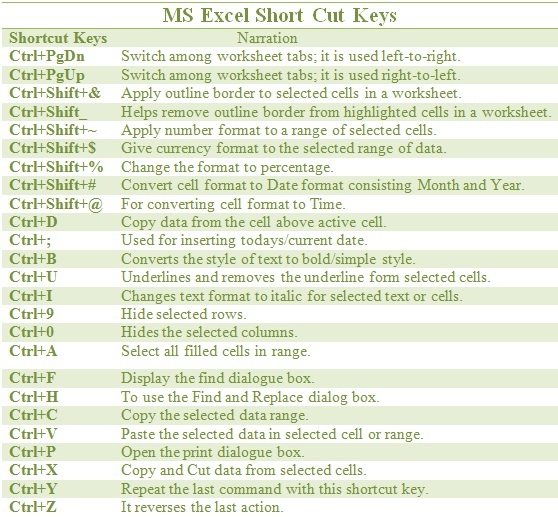 Ctrl+Shift+$: Give currency format to the selected range of data. Ctrl+Shift+%: Change the format to percentage. Ctrl+Shift+#: Convert cell format to Date format consisting Month and Year. Ctrl+Shift+@: For converting cell format to Time. Ctrl+D: Copy data from the cell above active cell. Ctrl+; Used for inserting todays/current date. Ctrl+B:	Converts the style of text to bold/simple style. Ctrl+U: Underlines and removes the underline form selected cells. Ctrl+I: Changes text format to italic for selected text or cells. Ctrl+0: Hides the selected columns. Ctrl+A: Select all filled cells in range. Ctrl+F: Display the find dialogue box. Ctrl+H: To use the Find and Replace dialog box. Ctrl+C: Copy the selected data range. Ctrl+V: Paste the selected data in selected cell or range. Ctrl+P:	Open the print dialogue box. Ctrl+X: Copy and Cut data from selected cells. Ctrl+Y: Repeat the last command with this shortcut key. Ctrl+Z: It reverses the last action.